Typically, I prefer to come to the client's home to see the behavior in the dog's comfortable setting. I will spend some time getting to know both the client and the dog/s, listening to key issues and observing energy and interaction. As each animal is different, there will be large variability in each consultation. I will always want to address the walk and on-leash behavior. In some situations I have taken the dog into my home to work with in a more intensified manner, but this is rare. In most situations only 1 or 2 visits are performed, but as the issues progress I am willing to continue working with the family to create balance. Feel free to contact me and discuss what methods might be best for you. For a 3 or 5 pack we are more likely to venture out, include other dogs, and even include the dog park depending on the needed areas of work for your dog. Remember, nothing is more powerful in making behavior change than a pack, so using other dogs to help your dog is likely to be the best avenue. Have you hearD of Stunt puppy? My friend Loki and his best friend Nate Model the new Stunt Puppy harness with hands free belt and leash after a swim at the Minnehaha dog park! 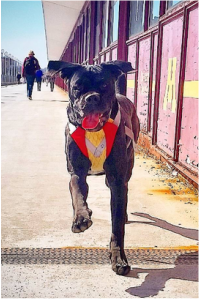 ​Stunt puppy is a fantastic Minneapolis based company known for its hands free leashes, cool gear, and dog supplies for active dog owners like myself! to get your own supplies so you and your pup(s) can get more healthy exercise, the foundation of a happy dog! Baron looks great in his new harness which has silky and adjustable straps which are perfect for his large shoulders. Terra Paws has always had great interactions with Dr. Jina Andrews and her team out in Elk River, MN, and is super excited to be working with them! Through this new business partnership I hope to pass on to my clients the wonderful tips Jina has passed on to me, and hope to serve them by helping any and all of their patients in need of behavior help. This also gives me access to the most desperate of situations, such as those who call the center asking for euthanasia for behavior problems, which they then historically simply had to turn away with sadness, being unable to help.A special thank you to Kathryn and CC for being my first official client connection with Animal & Exotic Wellness!! Thank you for your support of terra paws at the american cancer society's "bark for life" event! 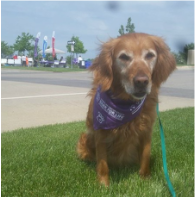 On June 6th we had a great time participating as a team at the Bark for Life event, and accomplished our fundraising goals! Thank you to all those who supported and participated and we hope to do it again next year! !